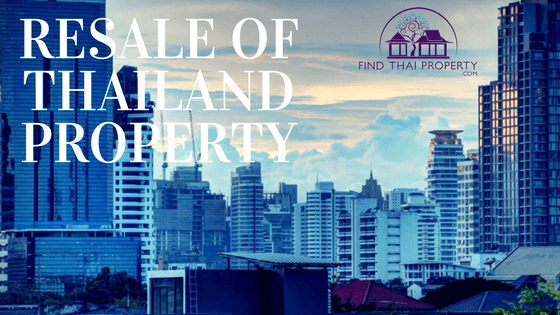 There may come a time where you wish to sell your Thailand property – maybe you are moving back to your country or origin or maybe you are simply moving to a new city or a new development. A concern for many property owners is how easy it is to sell a property once it has been lived in for several years. There is nothing worse than advertising your property and having no interest whatsoever. This can cause problems in the property chain and slow down the process of moving; furthermore, it can tie up much-needed funds that you may require to purchase a new abode. What contributing factors can affect the resale of a property? The state of the current property market in Thailand can play a large factor in ease of resale. Supply and demand is the basic mechanic of business – if the demand for housing is low, you may struggle to sell your property. Currently, the Thai property market continues to experience minimal growth, especially in foreign investment and demand for land. When selling a property, be sure to research the current economic climate in Thailand. Location is another big factor – is your property situated in a desirable area? Is there any planned investment upcoming? Does your local area have adequate amenities, public transport links and recreational opportunities? A favourable location can go a long way to improve your resale prospects. Some properties simply sell quicker than others – this is an unavoidable fact. For instance, a condo in the centre of Bangkok will usually sell quickly as there is a high demand for this type of abode. When purchasing a property, consideration should be given to the type of property as this can affect the resale process in the future. How can you improve your chances of selling your property? If you do not advertise your property, how will potential buyers know it is for sale? Word of mouth does not work for selling properties. Advertise your property online, in local newspapers or even using a real estate agent. The more avenues of advertising you use the greater exposure your property will gain. If your property is poorly maintained, unclean or untidy; potential buyers will be less inclined to make a purchase. If you look after your property and keep it looking immaculate you will create a great impression to buyers who take the time to view your property first-hand. If your property valuation is higher than the current market rate; you may struggle to solicit any interest. Why would a potential buyer entertain paying over the odds for a property if they can purchase a similar development for much less? Consider having your property valued by several independent sources and set a selling price that is realistic. If you take into consideration the contributing factors and improve the appeal of your property, there is no reason why it shouldn’t sell quickly. Finally, consider using a real estate agent to facilitate the resale process – their knowledge and experience will help greatly, especially when creating contracts and advertising your property.